(Lowell MA) Neither team expected to even be in this game! St. Mary’s was young while Amesbury was seriously reconstructed. 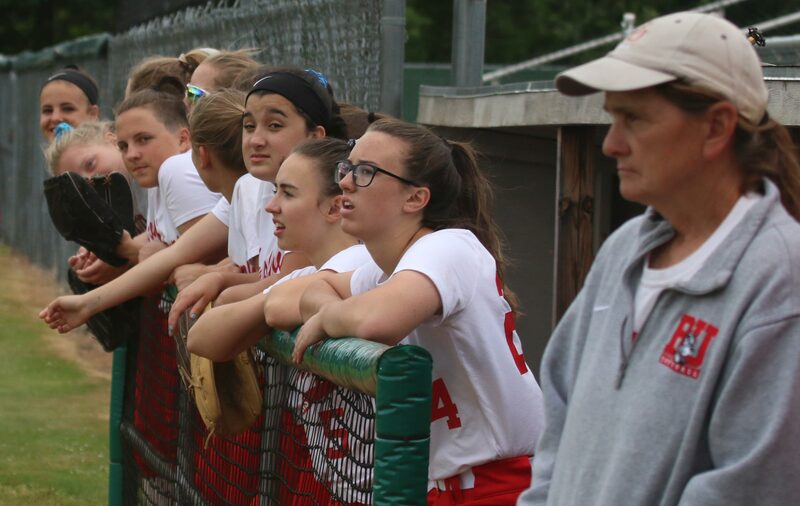 On this afternoon, it was the reconstructed team that put enough pieces together to win the Division 3 North softball semifinals 4-2 at Martin Field in Lowell. 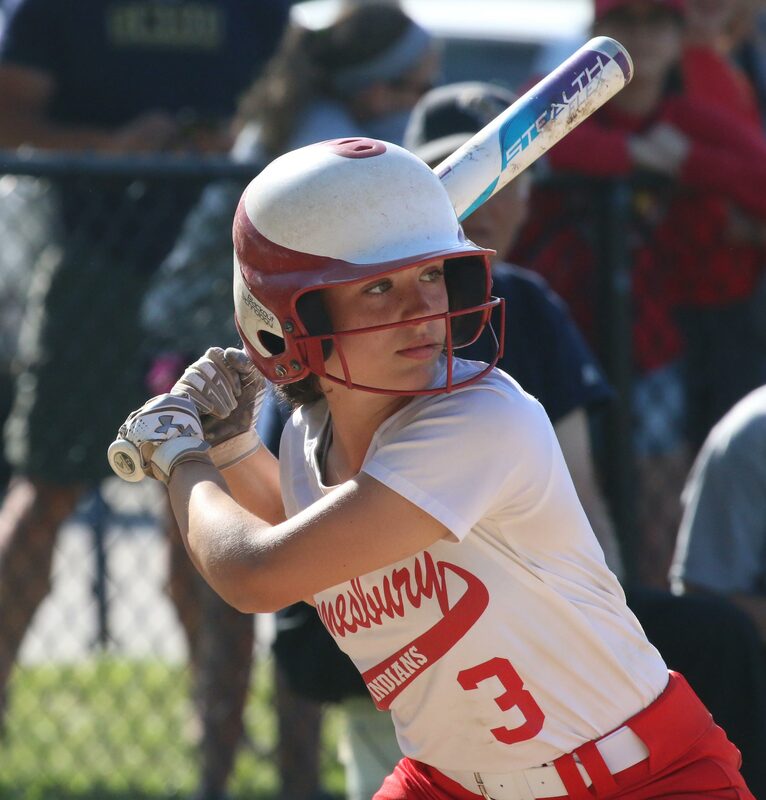 The top piece for Amesbury (15-8) was senior Hayley Catania. 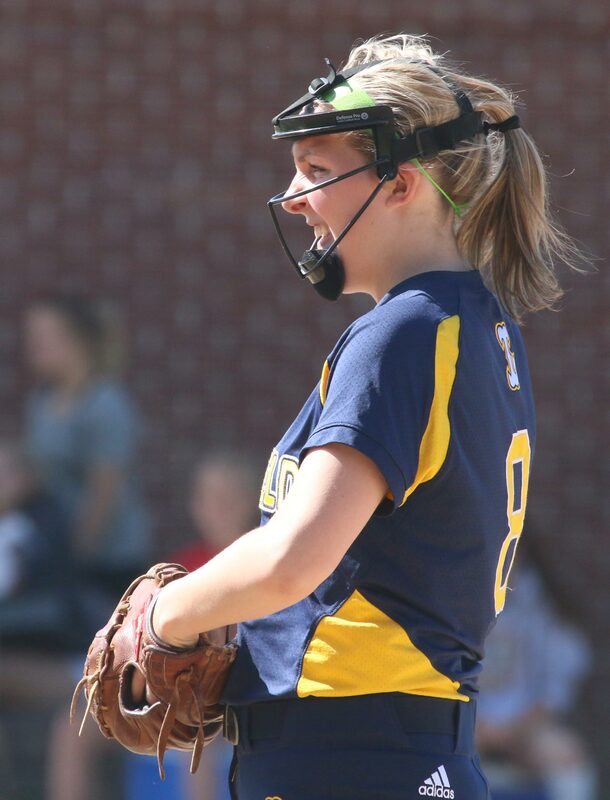 The AHS pitcher allowed five hits (three of them in the first inning) and struck out ten Spartans. 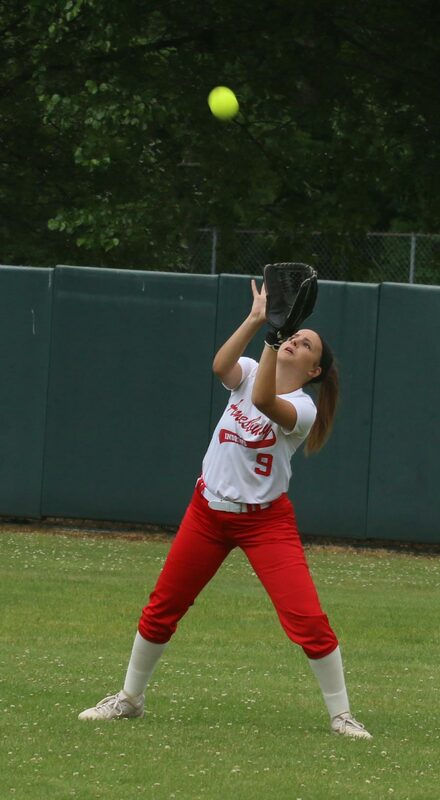 But there’s more to the story: Hayley also had two hits and an RBI. Her alert baserunning keyed one of the Indians runs in the 2-run fifth. Both teams had powered past quarter-final opponents. 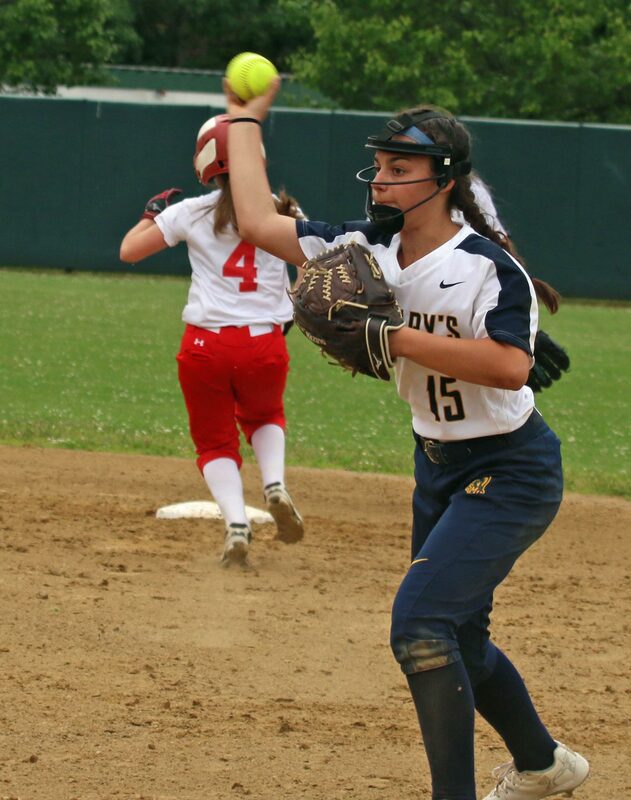 St. Mary’s had four homers versus Pope John while Amesbury had three long ones against Lynnfield. 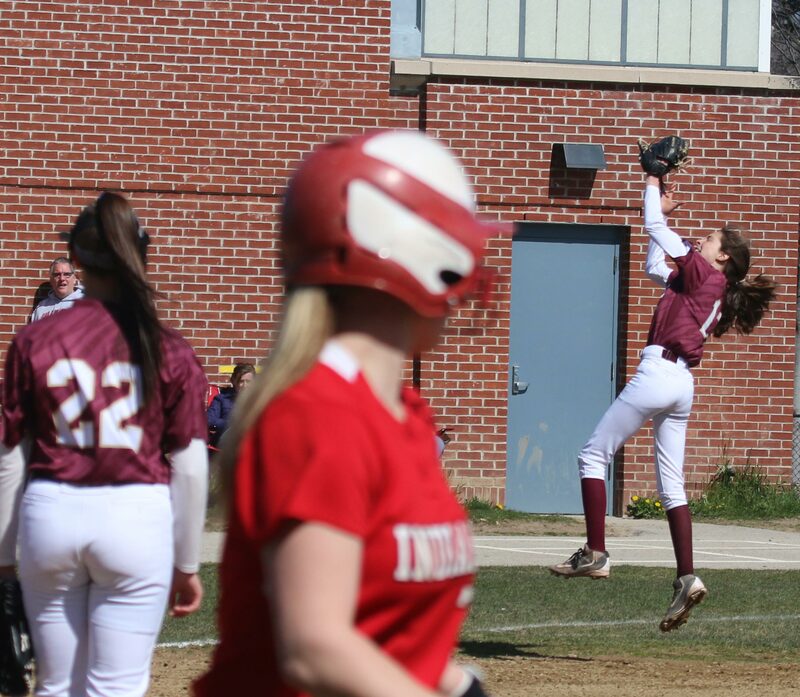 Today’s contest had only two loud hits and both of them were by Amesbury. 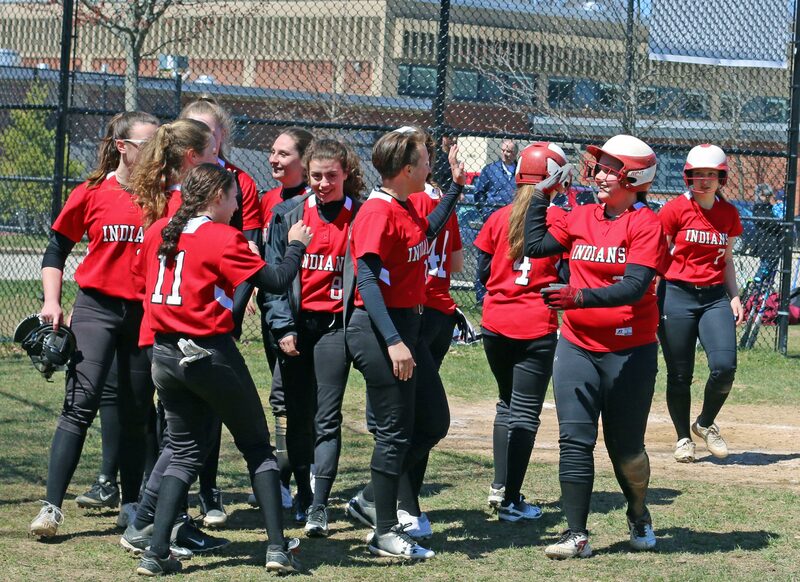 Emma DiPietro had a triple in the 2-run fifth and Hayley had an RBI double in the Indians 2-run seventh. 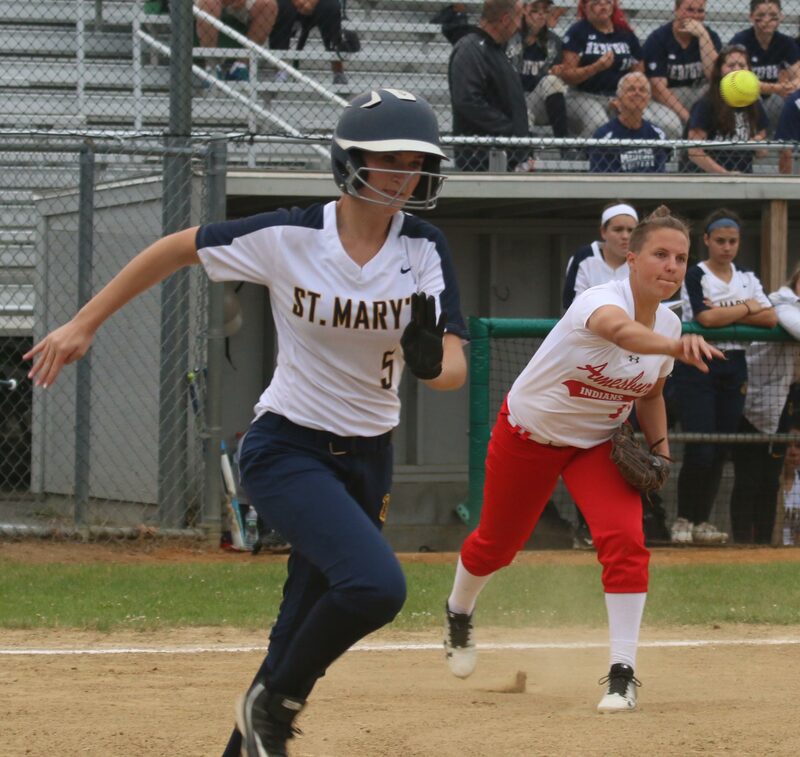 St. Mary’s (14-9) scratched out a run in the first. 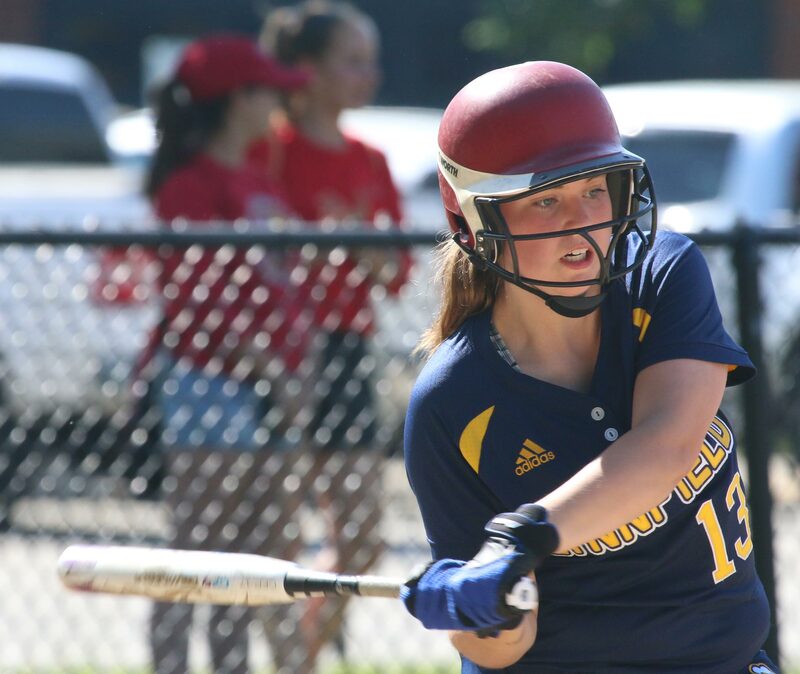 Consecutive singles (Felicia D’Alessandro, Marina DiBiasio, Jordan Sullivan) produced a run. 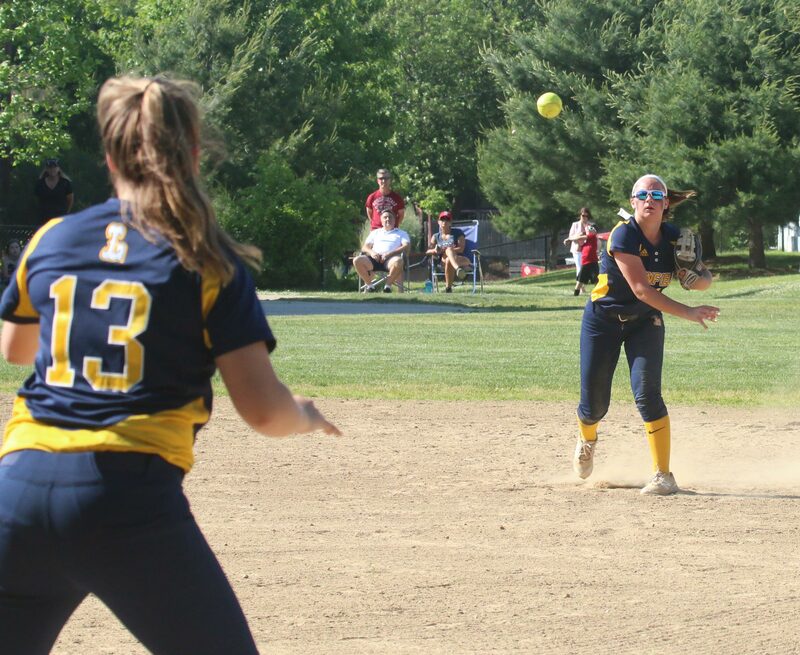 This was where Amesbury’s Hayley Catania gave us a glimpse of the kind of game she would have as she then struck out Jennie Iudice and Taylor Sullivan to end the inning. 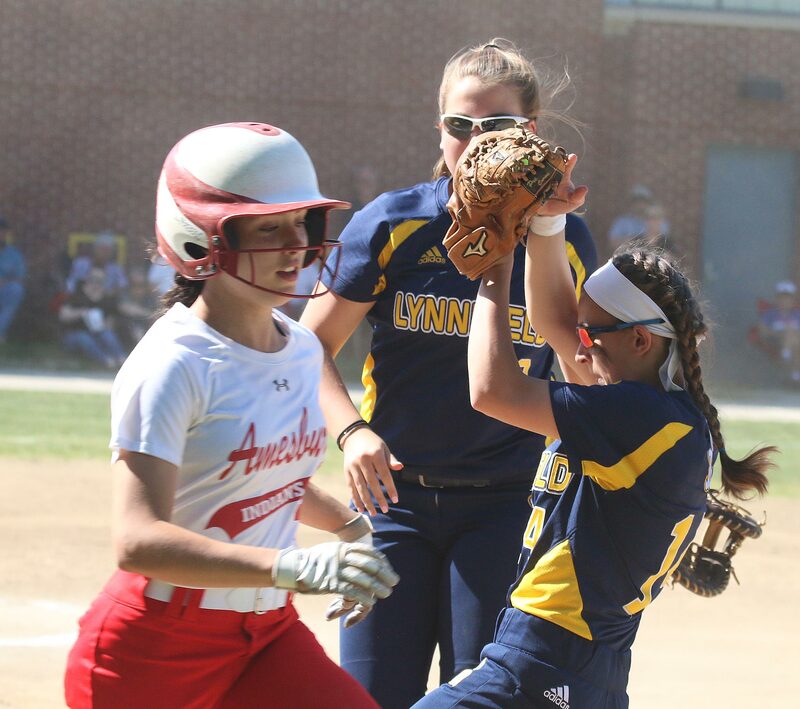 Amesbury had runners in scoring position in each of the first three innings, but pitcher Lily Newhall kept the ball in the infield and escaped being scored on. 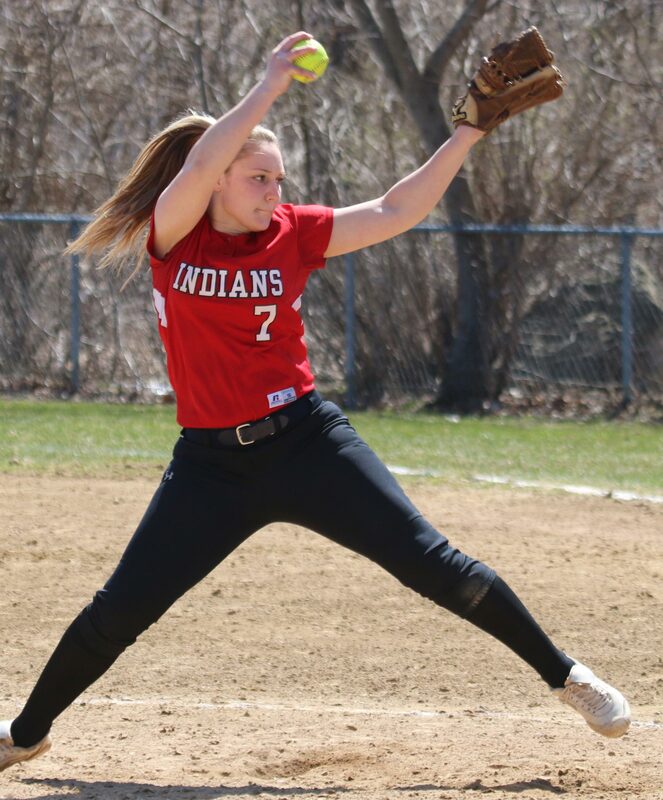 Starting with the 2 K’s in the first inning, Hayley retired eleven in a row including six strikeouts. 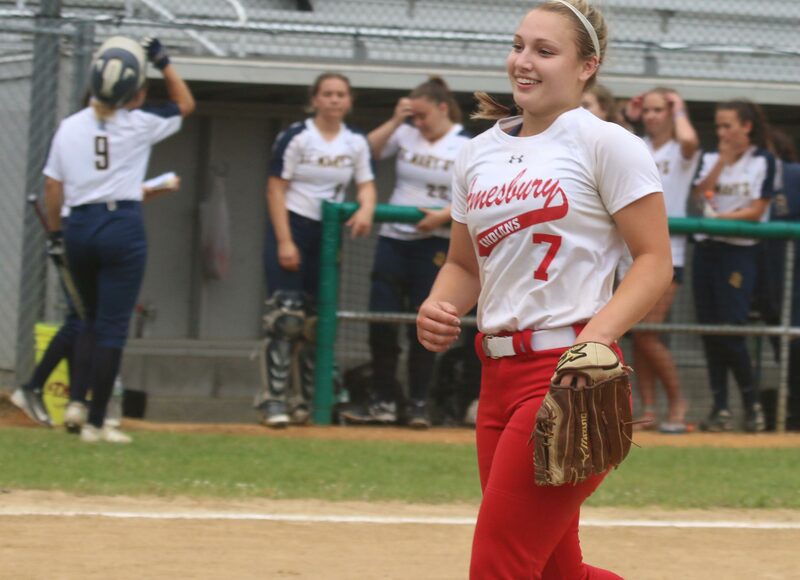 While the pitching was terrific for Amesbury they still trailed by a run until the fifth inning. 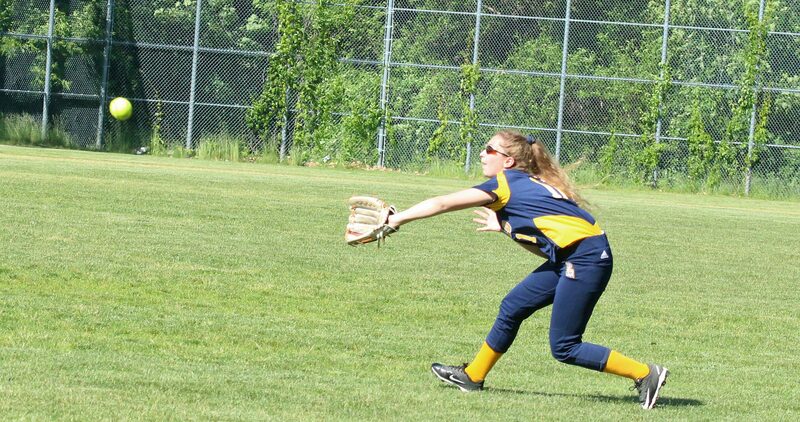 Emma Catania singled home a run in the 5th but was thrown out stretching it. 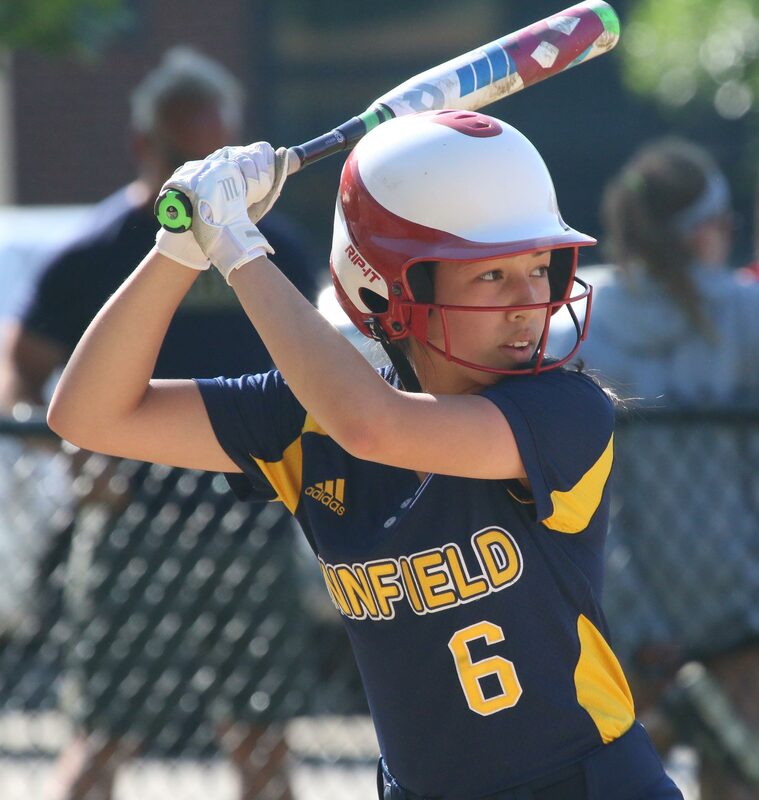 Junior Emma DiPietro tripled with one out over CF Christina Nowicki’s head. 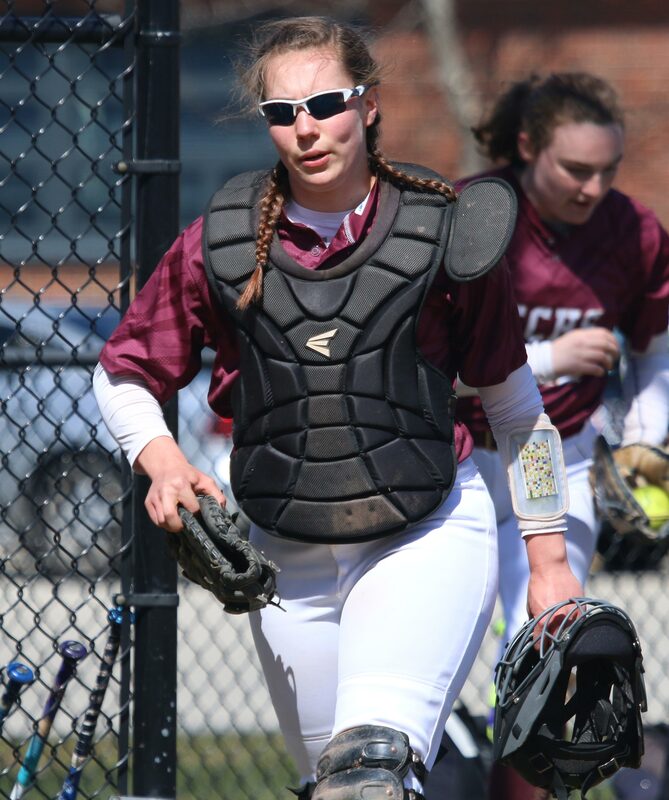 Hayley Catania walked but on ball four the ball got away from catcher Jordan Sullivan allowing Emma to score and tie the game. 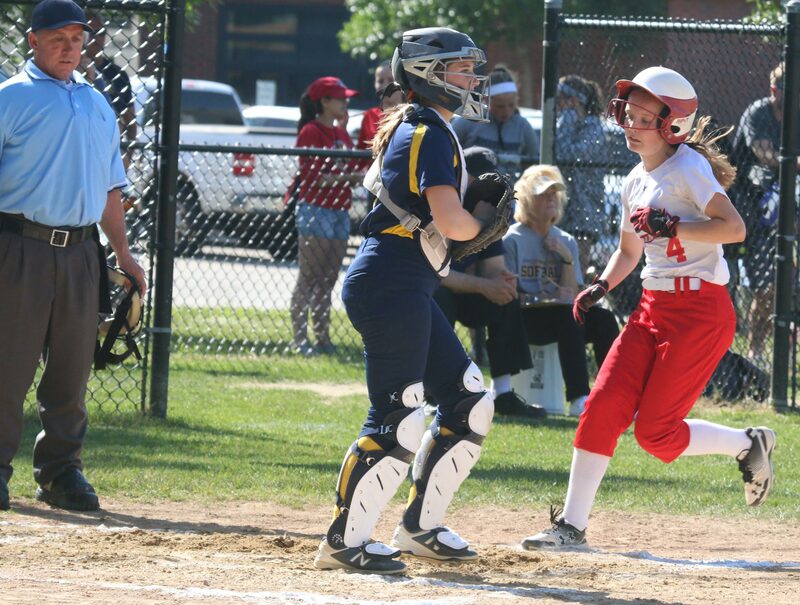 Hayley alertly took second when the Spartans concentrated too much on Emma crossing the plate. 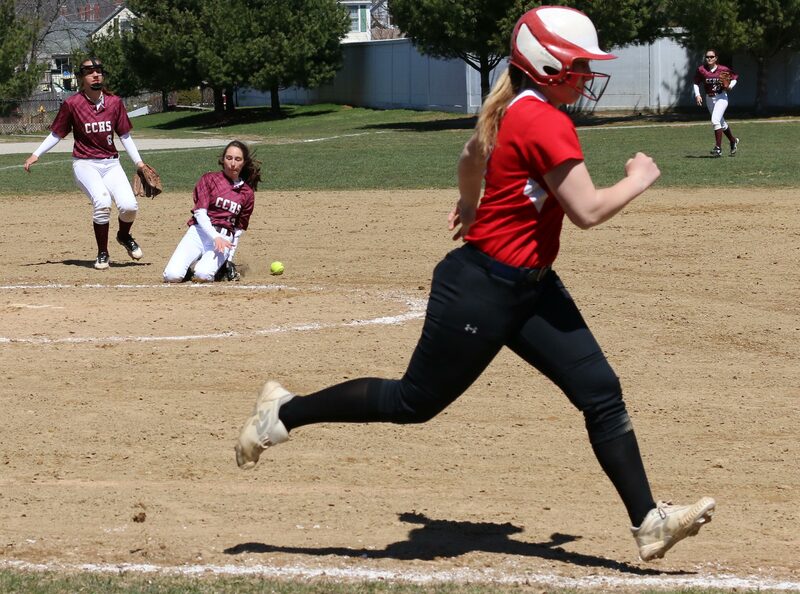 That alertness paid off for AHS because when her sophomore sister Emma singled to center, Hayley came home with the go-ahead run. 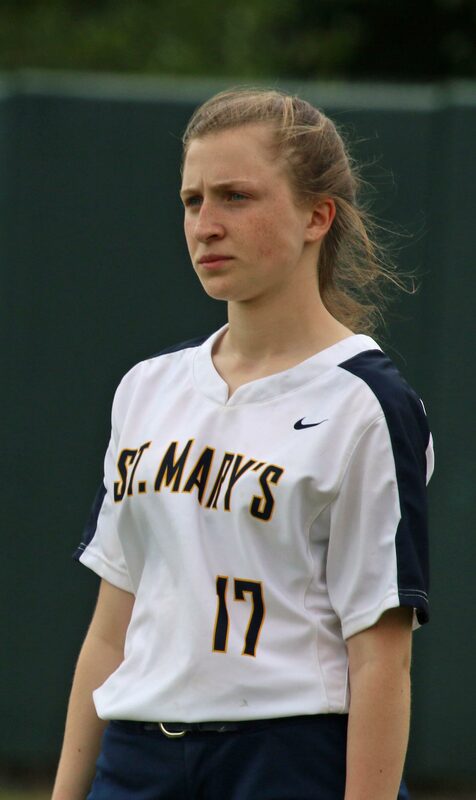 Now down, 2-1, the pressure was on the St. Mary’s offense. 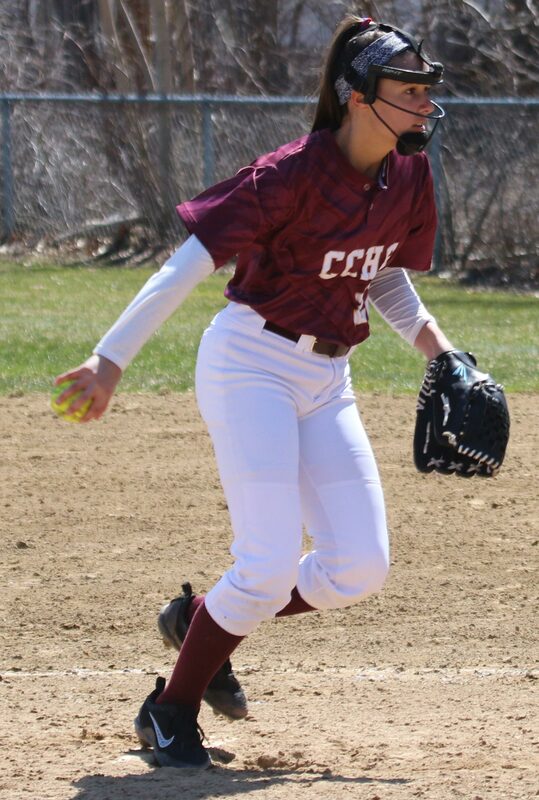 Alyssa Grossi singled to center opening the bottom of the 5th. 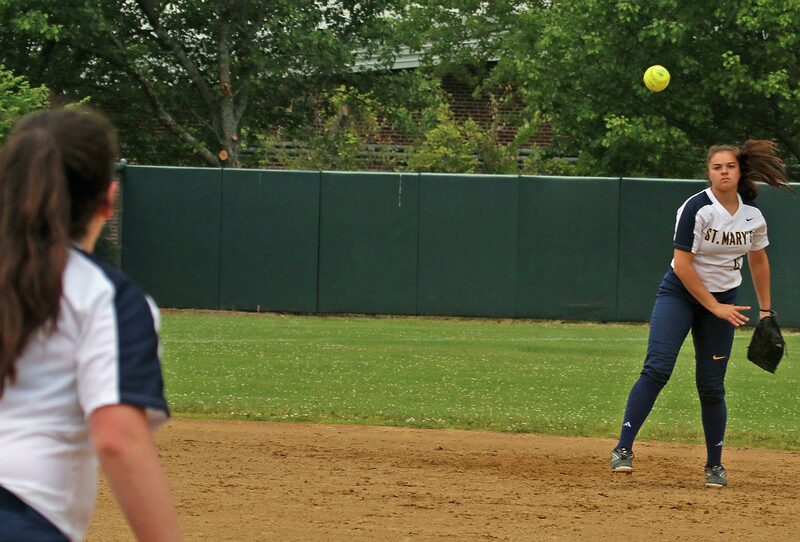 A sacrifice bunt (Katie O’Neill) moved her to second with one out. 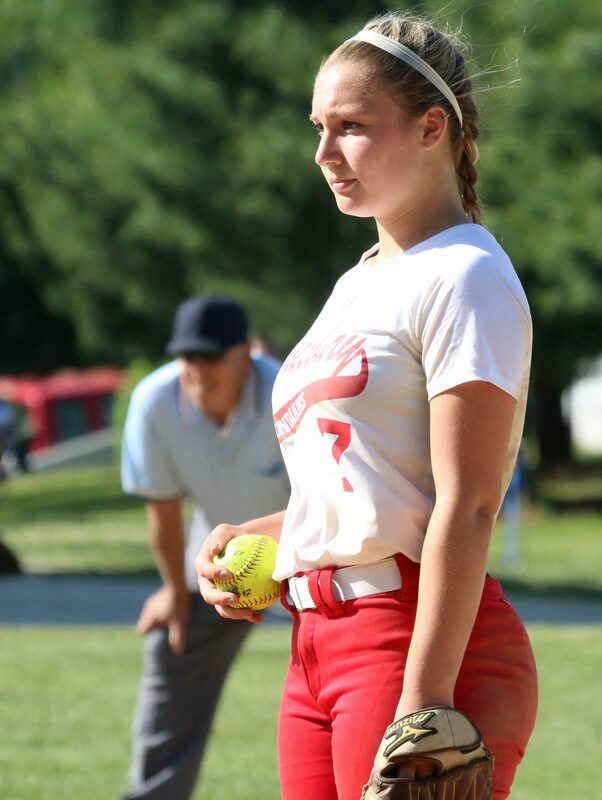 But here came Hayley Catania, doing exactly as she had done in the first inning, striking out the next two batters (Angelina Catino and Christina Nowicki) to hold the slim lead. Both teams went down in order in the sixth. The seventh was not for the weak of heart on either team! 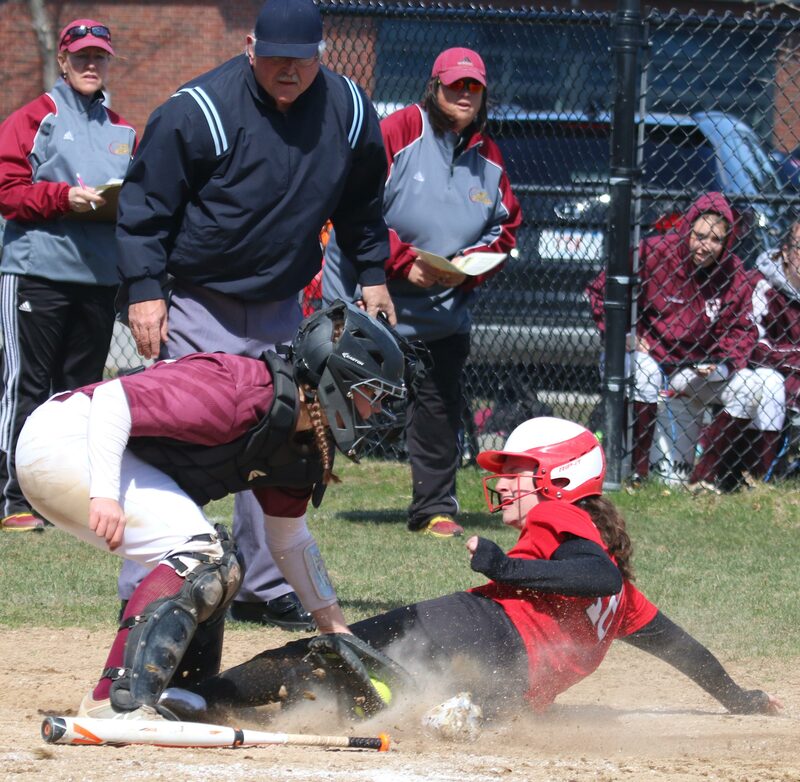 Amesbury put two runners on with no one out on a walk (Emily O’Donnell) and Julia Campbell reaching on an error by pitcher Christina Nowicki. 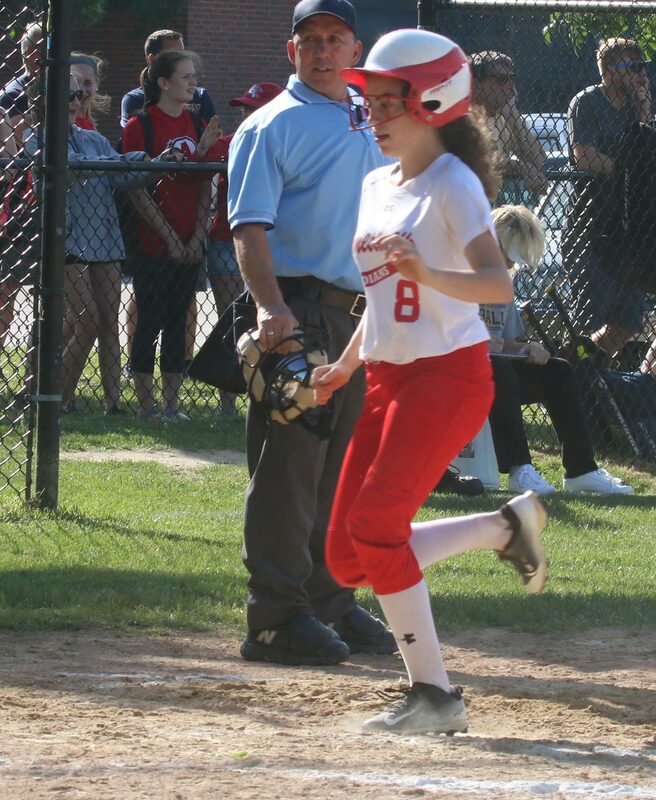 Freshman Maddie DiPietro pinch ran for Emily. 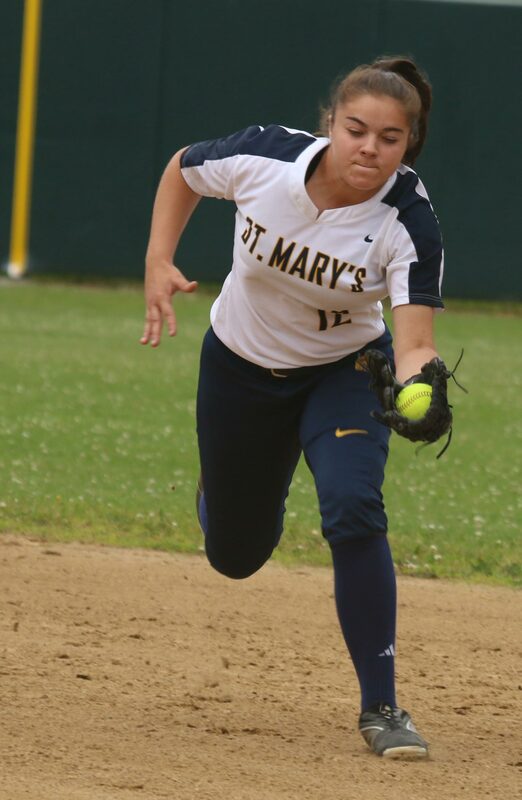 That brought up Hayley and St. Mary’s coach Paige Licata had a meeting at the mound. 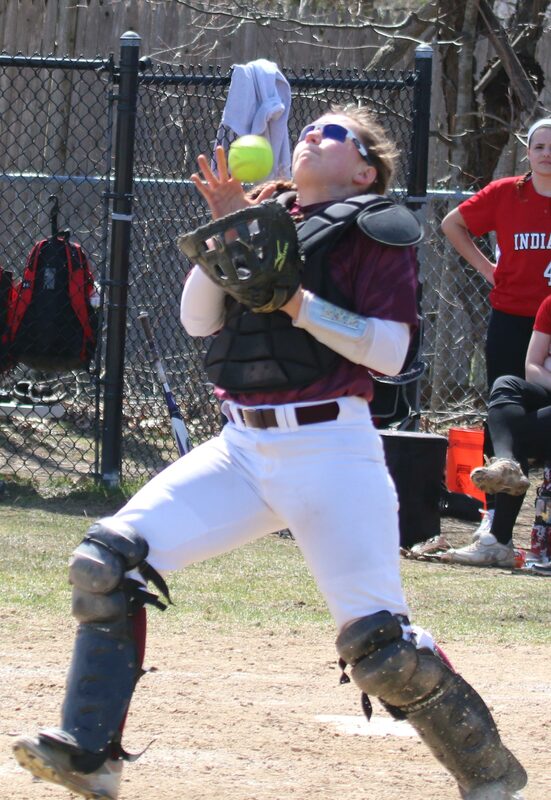 Hayley took that outside pitch over LF Julia Nickolau’s head bringing Maddie DiPietro across and getting Julia Campbell to third. 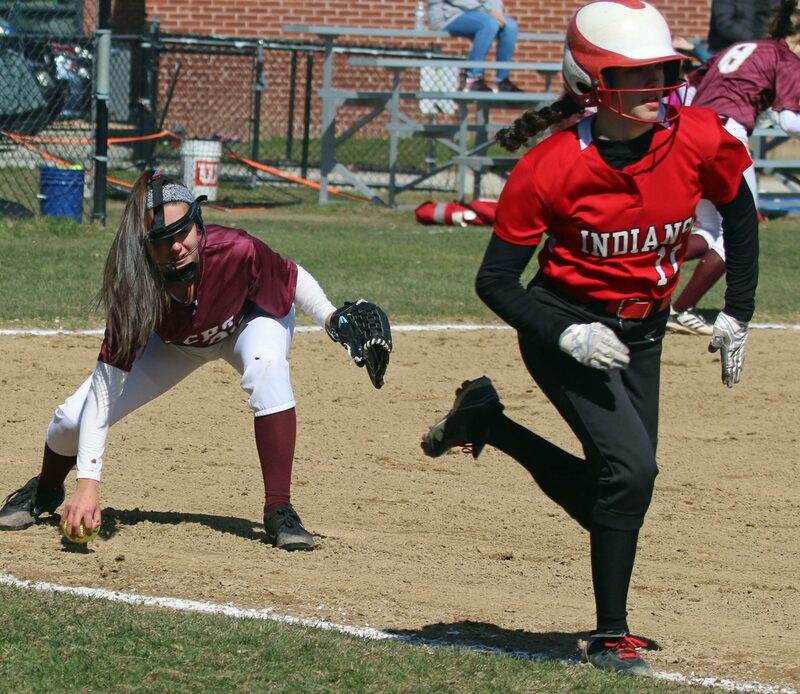 Senior Hannaih Burdick’s grounder to second enabled Julia to tally Amesbury’s 4th run. 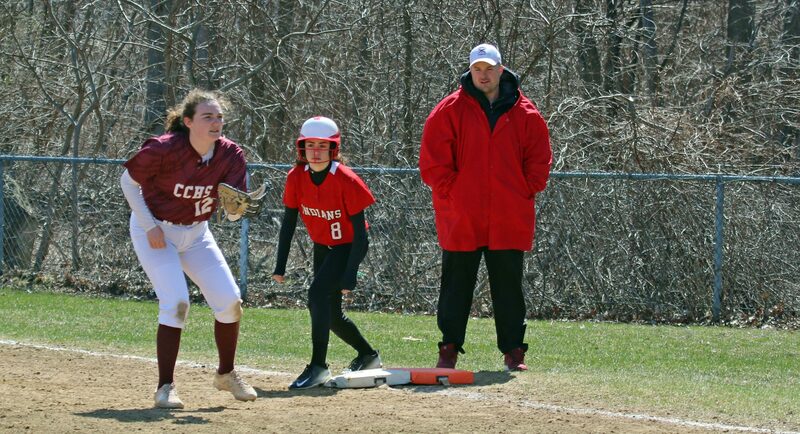 Maddie DiPietro (8) and Julia Campbell (10) wait on the bases to see if Hayley Catania’s long fly will be caught….it wasn’t. The Indians would need those extra runs in St. Mary’s final at-bats. 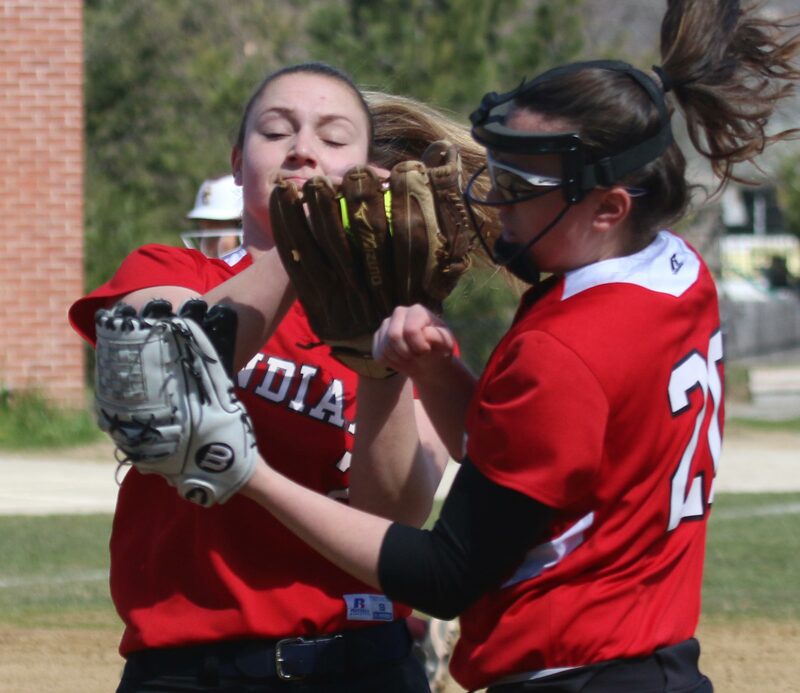 Things started harmlessly enough (for Amesbury) as two Spartans struck out. 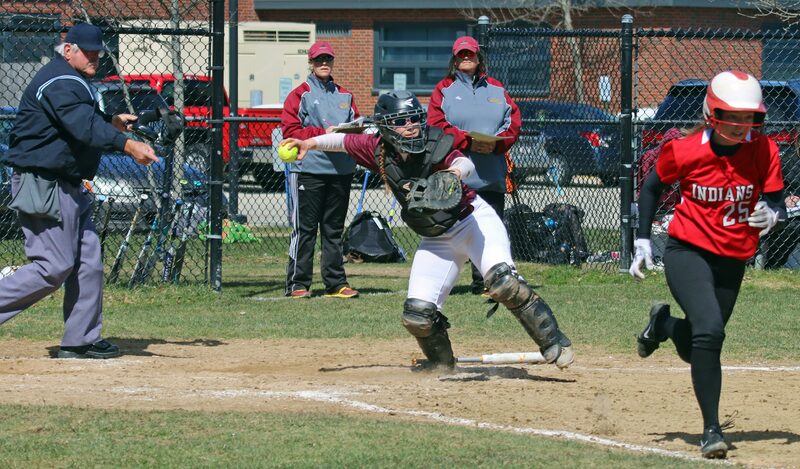 Then Hayley walked Alyssa Grossi and Katie O’Neill followed with a 2-strike single to right. Was a miracle comeback about to happen? 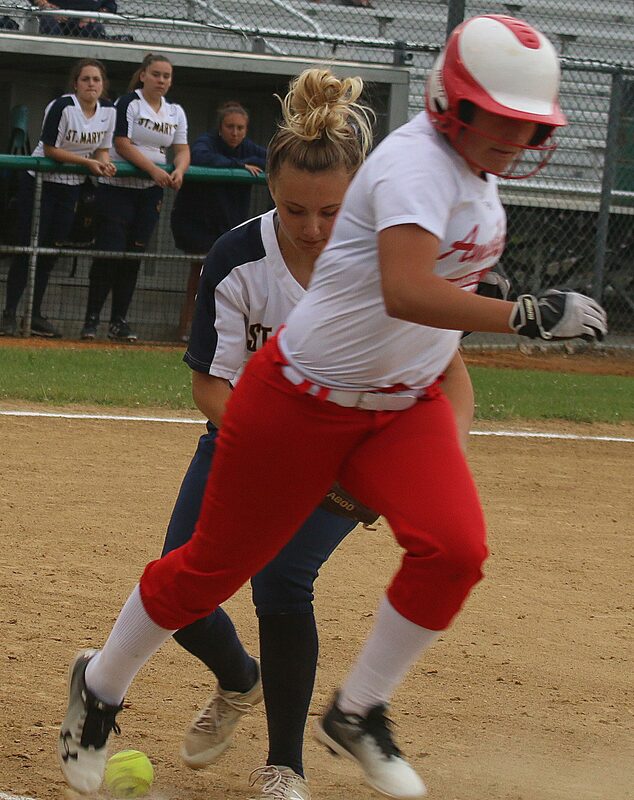 The Spartans created a rundown between first and second and Alyssa Grossi scored as Katie O’Neill got back to first safely. Now the tying run was at the plate. 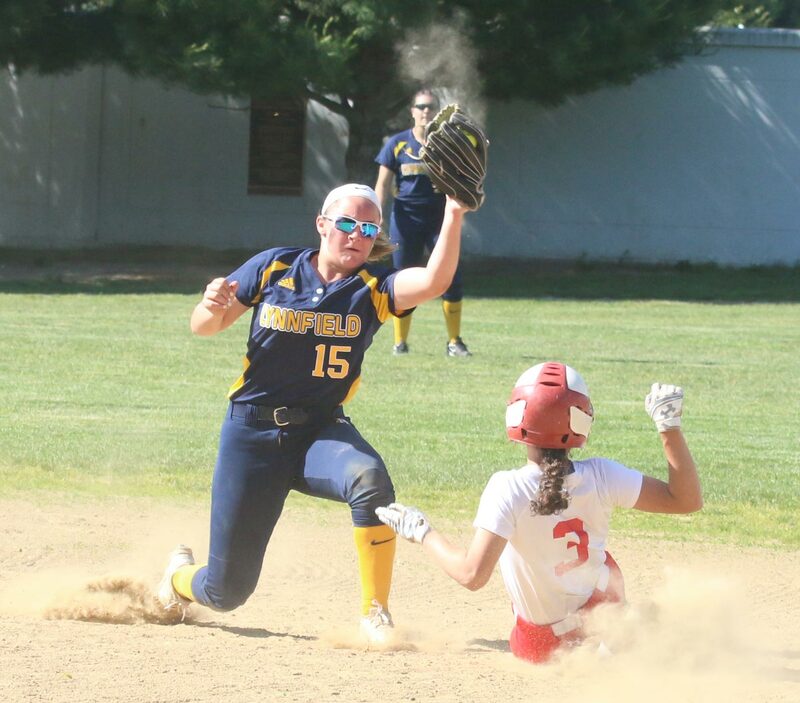 But Hayley got Angelina Catino to fly out to RF Karleigh Walker insuring Amesbury a trip to Saturday’s North final against Austin Prep. 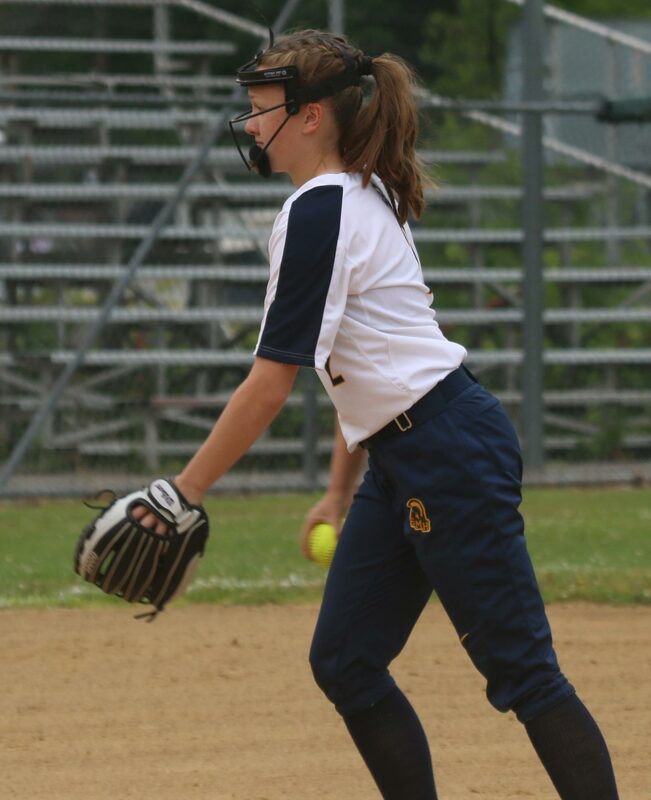 Lily Newhall gave up five hits over six innings. 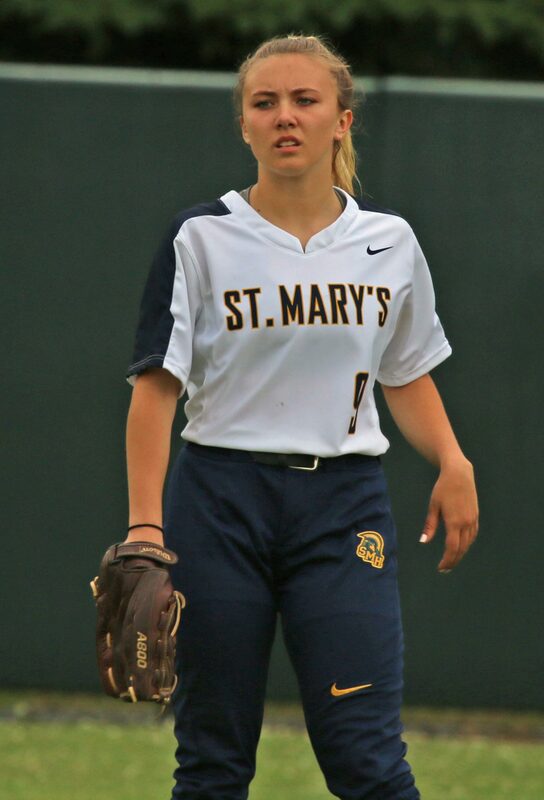 St. Mary’s had only three outfield outs, all to RF Karleigh Walker. Weather looked as if it could rain at any time. 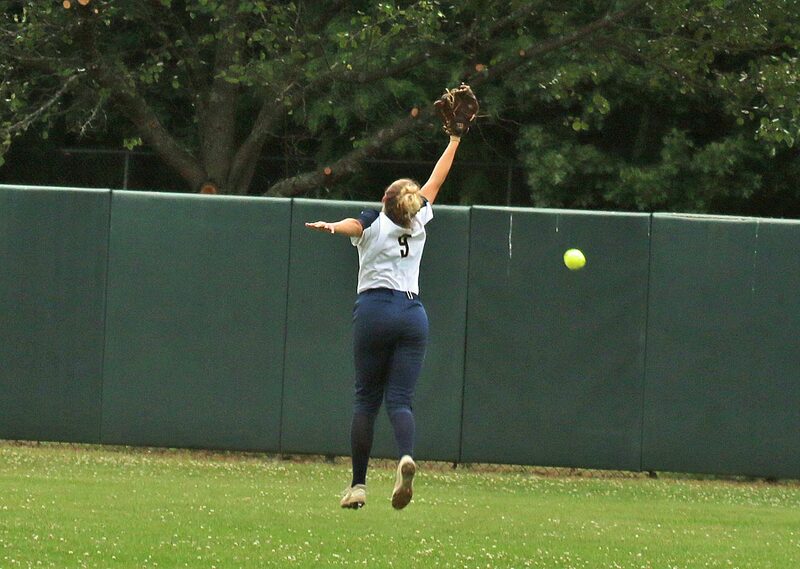 RF Karleigh Walker successfully handled three fly balls including the one that ended the game. 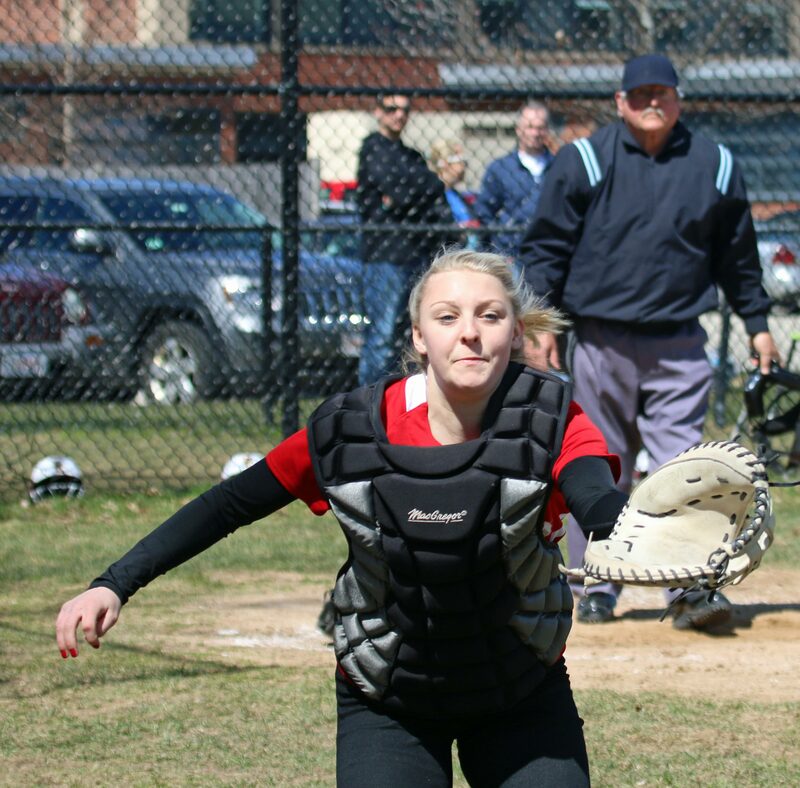 No one I talked to afterwards knew when the last time was that Amesbury softball had beaten St. Mary’s. Coach Waters guessed that it might have been 2005. It had obviously been a while! I did see Amesbury soccer defeat St. Mary’s in the tournament this season at Landry Stadium. 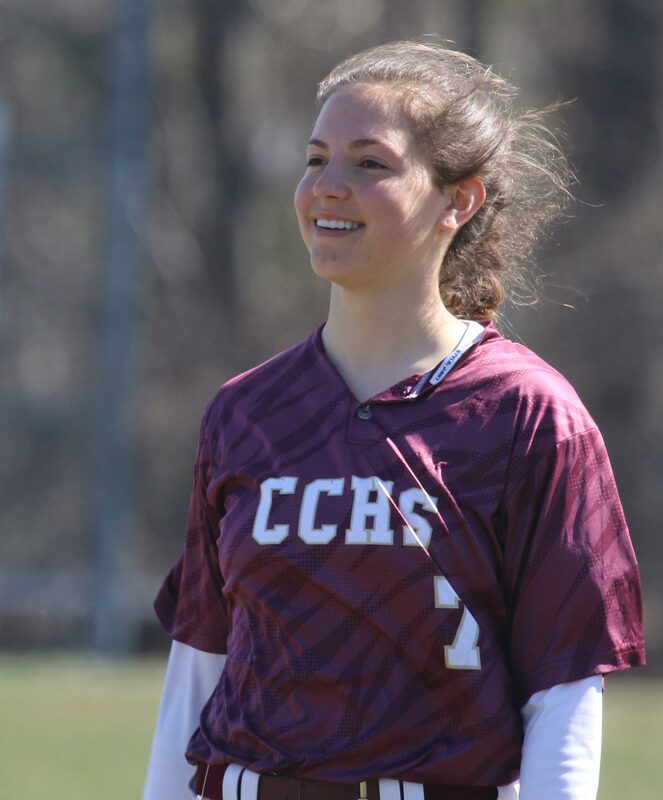 (Amesbury MA) The undefeated Concord-Carlisle Patriots crushed Amesbury, 16-6, on Saturday morning in a non-league game. 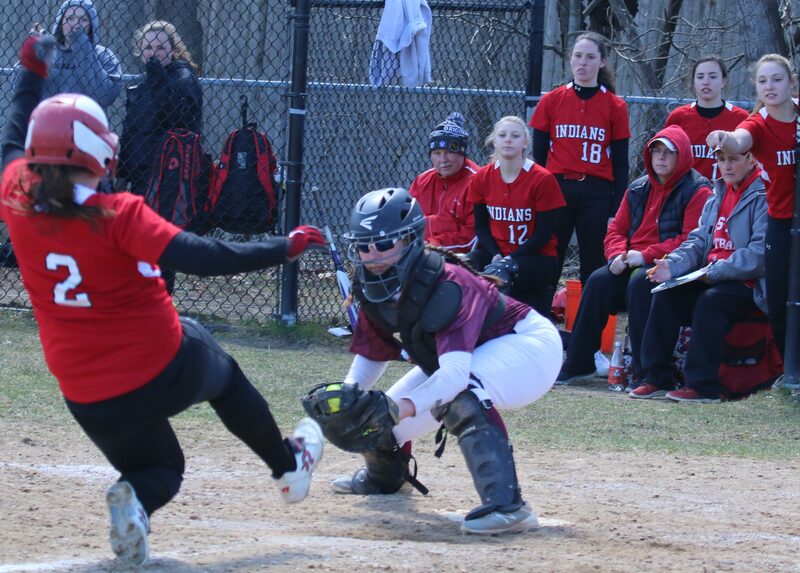 The Patriots (3-0) batted around in two different innings and rapped out twelve hits including two homers in an impressive display. 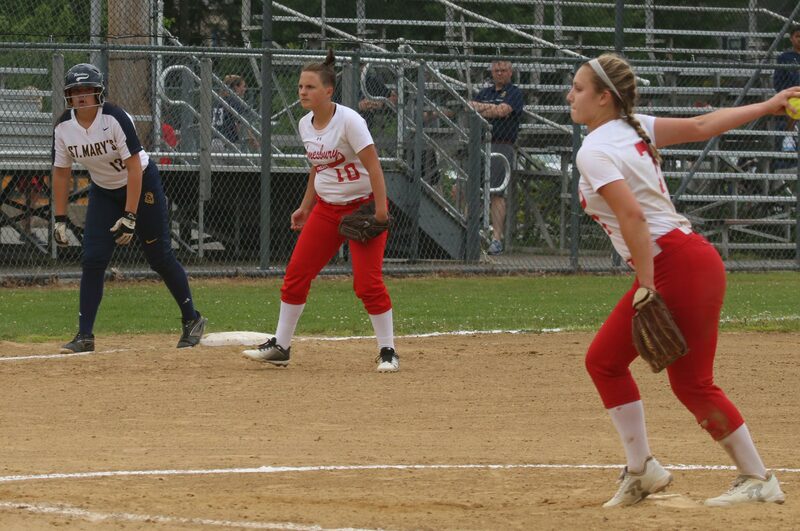 Amesbury pitchers (Hayley Catania & Emily O’Donnell) were hit hard and surrendered twelve walks. Seven of those walkers scored. 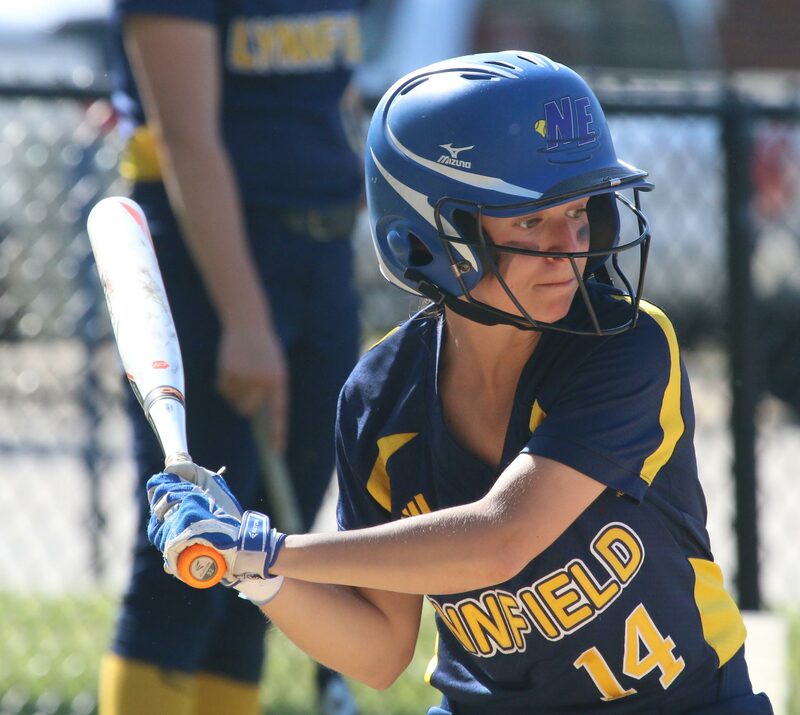 Senior Nicole Small went the distance for the team from the Dual County League. 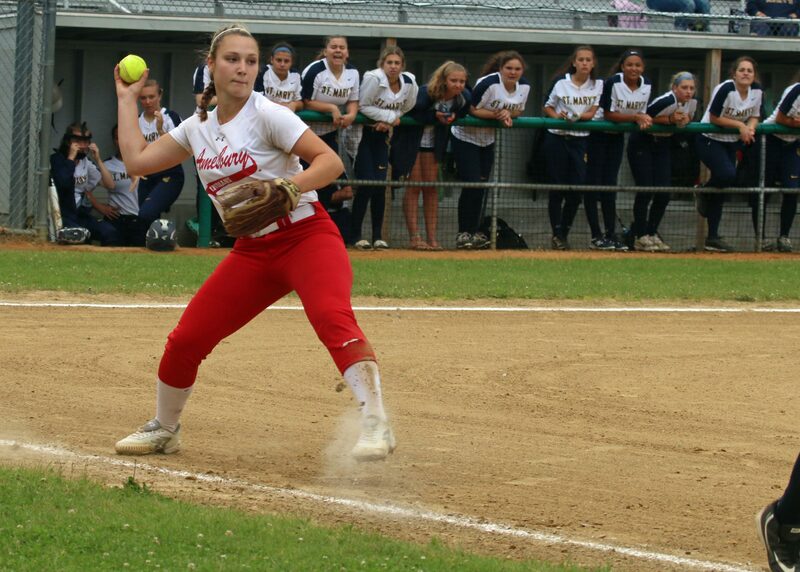 Nicole gave up seven hits, two each to Hayley Catania and Karleigh Walker. Fenceless Perry Field is not the easiest place to hit a home run but there were three in this game. All three shots (Maeve Devlin, Virginia Ryan, Emma Catania) were to the right side and probably would have left a fenced field. All three homers were so well hit that there wasn’t a play at the plate in any of them. 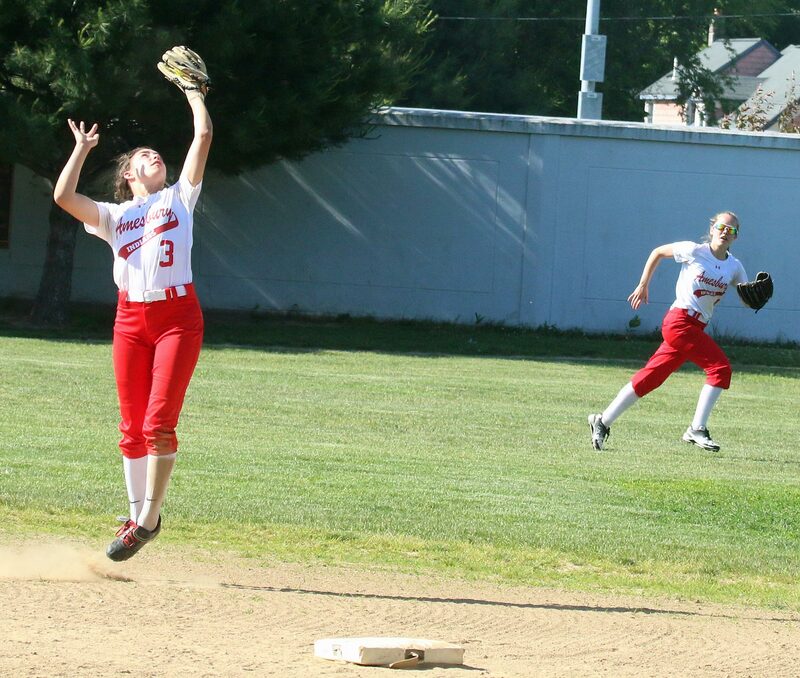 The Patriots had their two-run homers within the first three innings and jumped ahead 8-0. The Indians came back with two runs in the fourth inning. 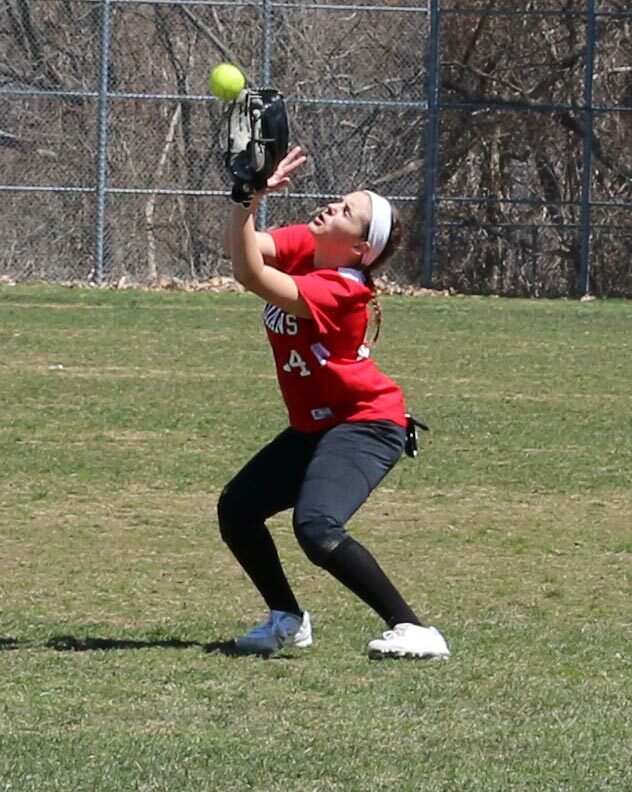 Emma Catania drove in the first on a fielder’s choice while the other one came in on an infield error (3B Alyssa Attonito). The visitors took the outcome doubt out of this one in the 6th inning. 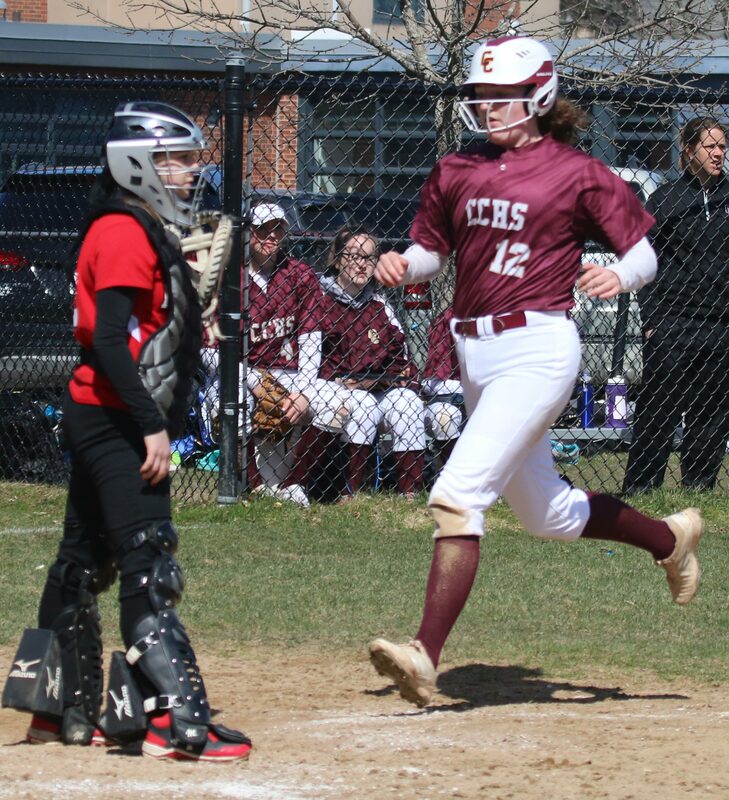 A bad combination (for Amesbury) of four CC hits and four Amesbury walks resulted in a seven-run frame and substitutions that I won’t even attempt to describe. The Indians put four runs up in their half of the 6th. 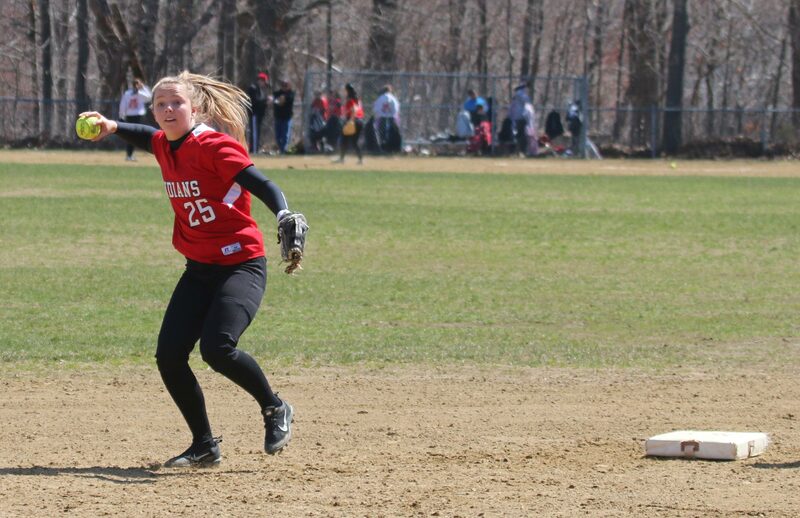 A two-out infield blooper by Hayley Catania brought in one run (Julia Campbell). 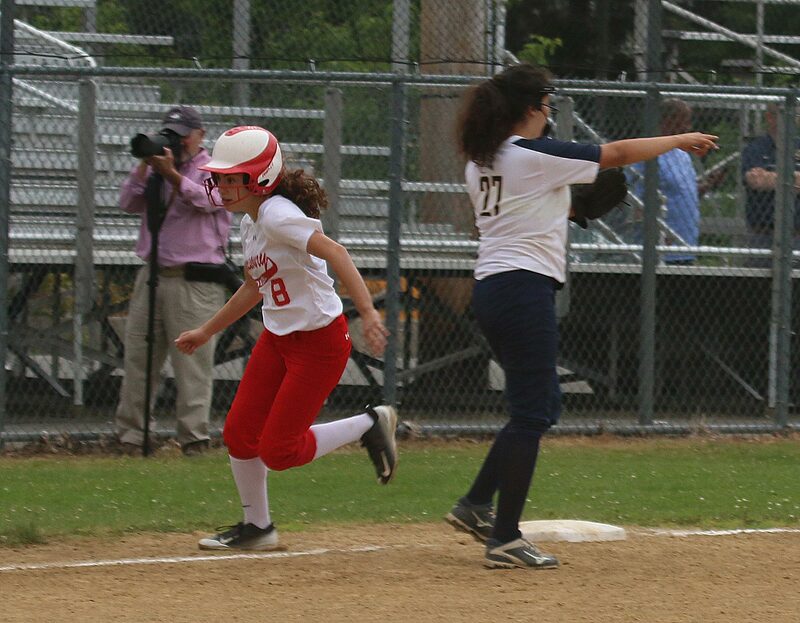 Sophomore Emma Catania went deep right to deliver the other three runs. 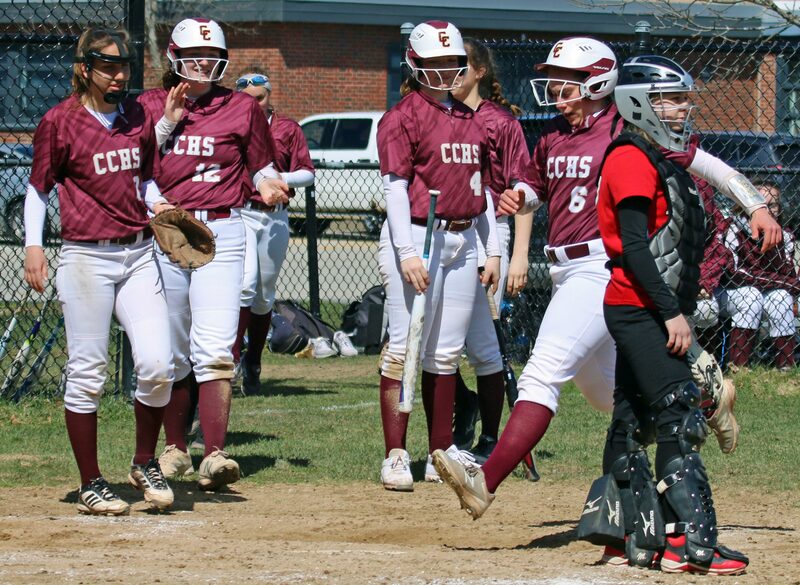 Against a good team like Division 1 Concord-Carlisle, the chances for a Division 3 teams like Amesbury to win would necessitate a lot of things going right. Not on this morning. Besides the hits and walks, the Indians twice ran into outs at home plate. 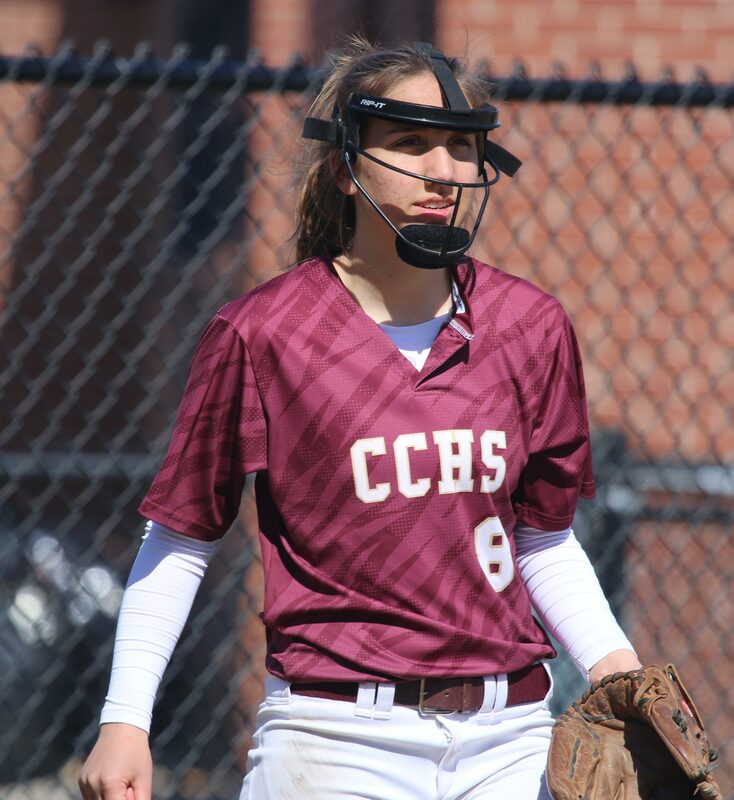 Credit CC on one of them: A Julia Campbell bunt, with Ashlee Porcaro on 3B, turned into a double play; pitcher to first to home. 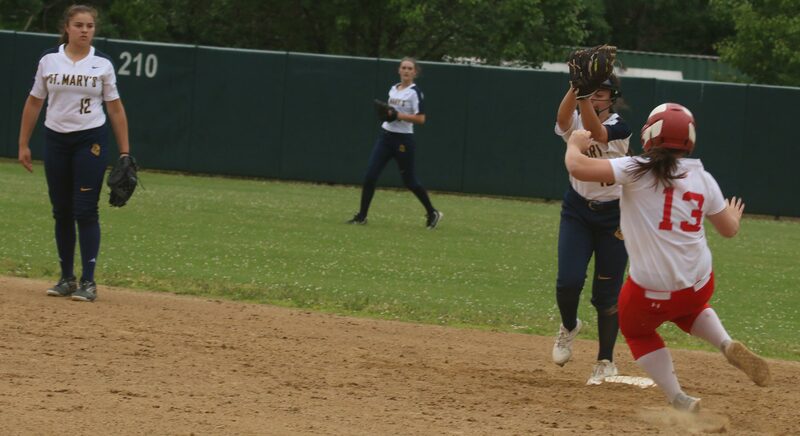 I have seen a few softball games, but I saw something happen in this game that was new to me. 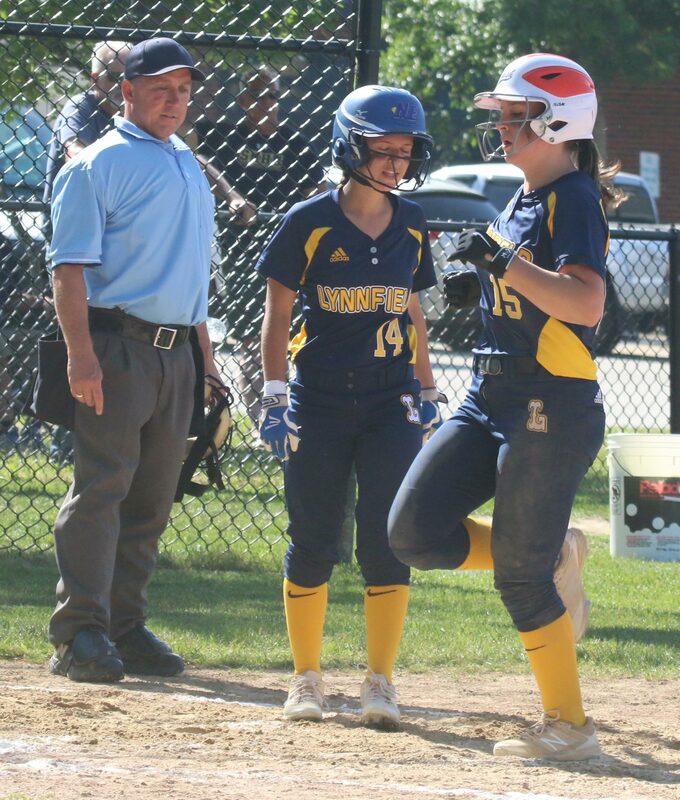 During the 7th inning, CC coach Lisa McGloin visited with batter Nicole Seeley. The conversation ended with Nicole being given a different bat. 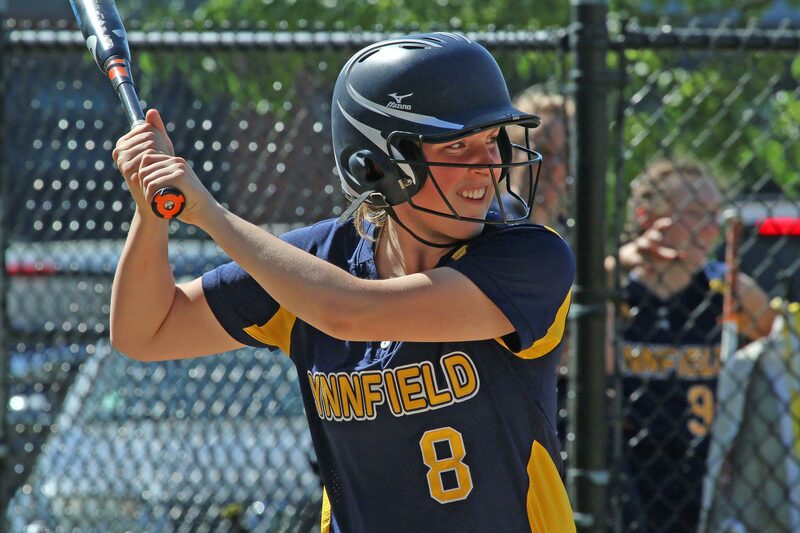 Sure enough, Nicole would use the different bat to drive in the Patriots 16th run. That’s what I call coaching! 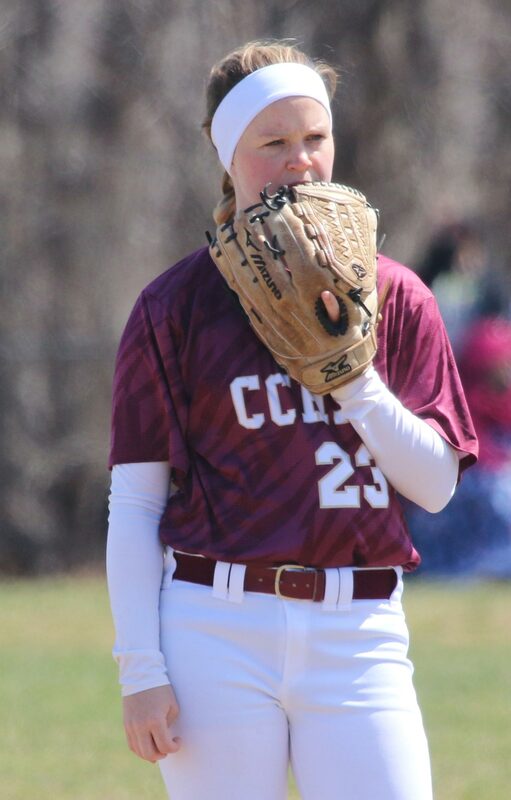 Amesbury has now lost four straight to CC. 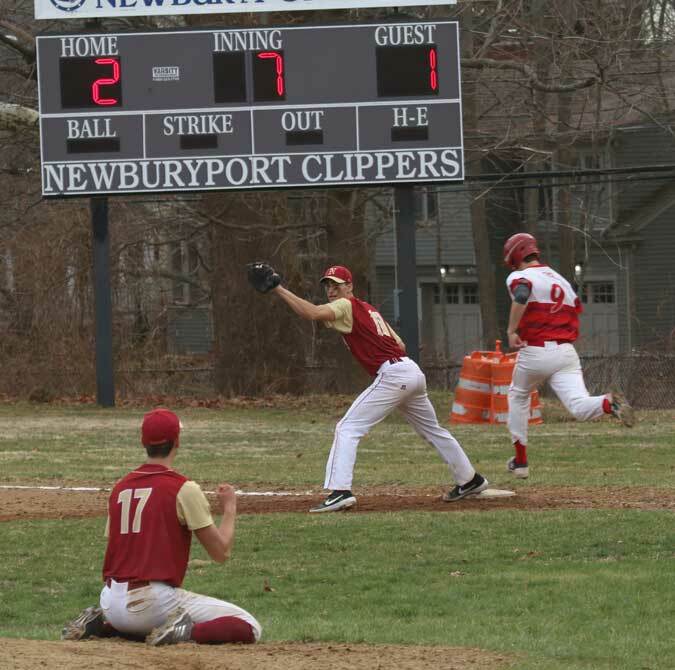 Amesbury was 17-7 last season while Concord-Carlisle was 18-3. Two very successful programs. 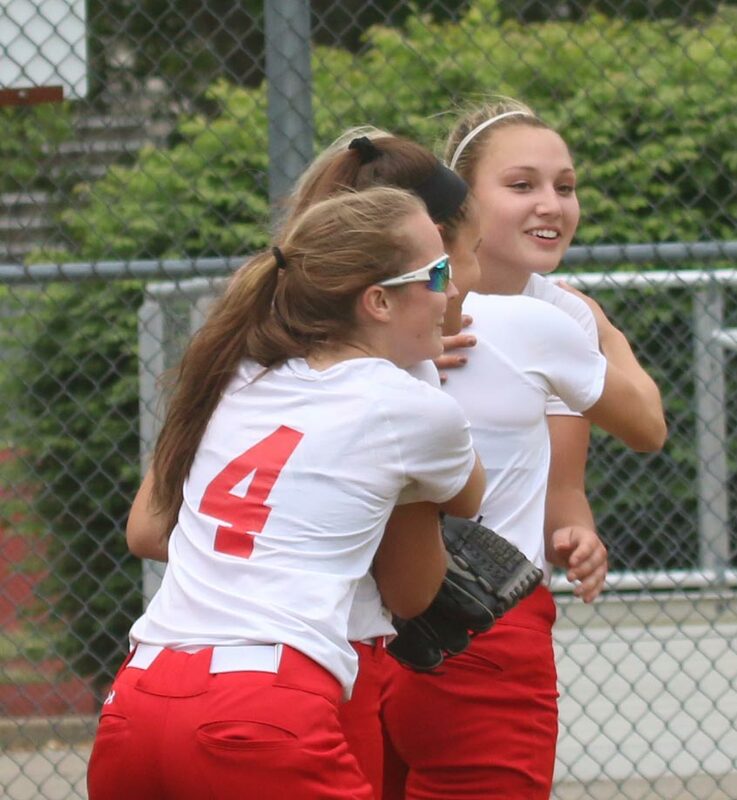 Amesbury has won the Cape Ann League Baker division four straight years. The sun was out but the breeze was too. At least there weren’t snow flurries like yesterday. One of the pictures I look today looked like there were ice-glazed trees in the background.